Scrobble using the official Last.FM client with Rhythmbox - OMG! Ubuntu! 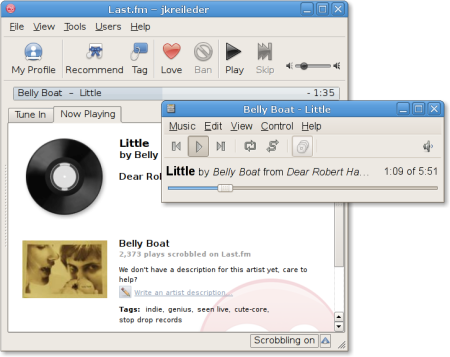 Although Rhythmbox comes with a last.fm plug-in to scrobble your plays to the Last.fm service itself it does lacks some of the features that the dedicated last.fm player (available for Linux) provides. Although the official Last.fm client doesn’t ‘detect’ playing tracks in Rhythmbox (or any major Linux media player) by default, it is easy to enable. Juergen Kreileder has written a new last.fm plug-in for Rhythmbox that, instead of scrobbling directly, submits tracks via the last.fm client application. Because the plug-in makes use of the official desktop client you can love and tag the song playing, as well as view additional data and recommendations. Ubuntu Lucid & Karmic users can add Juergen Kreileder’s PPA to install this feature and remain totally up-to-date with its changes. And… you’re done. Well, almost. You now need to enable the new plug-in via Edit > Plugins > New Style Last.fm scrobbler and disable the default one. Like the plugin? Found a bug? Be sure to let the developer know what you think over @ this link.